Chalford Stitchers and others from Chalford held a jumble sale in March 2016 to raise money for this organisation – and to raise awareness. We are continuing to support them as best we can. 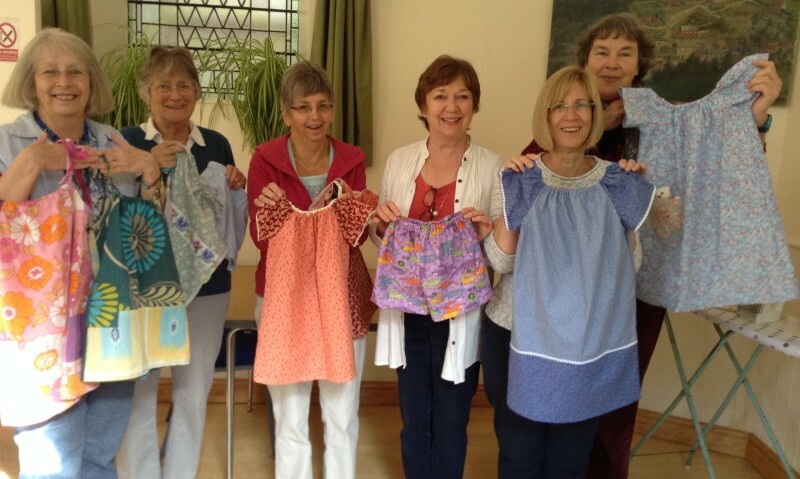 Some members of the group enjoy making quilts or knitting blankets. Inspired by the Linus Project, which makes quilts for children in hospital, we have started to produce quilts and blankets for the local women’s refuge. The women and children there have fled abusive men, and often have little to call their own. We aim to provide the refuge families with both actual and emotional warmth by donating individually designed and made bed covers, lap quilts and baby mats. Some of the quilts we have made for the refuge can be seen on the Gallery page. 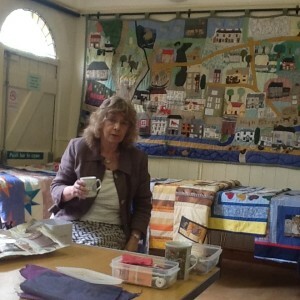 Angela, a representative of the refuge, telling us all about their work, on a day when we handed over 21 quilts and blankets. We have recently started making dresses and shorts for street children, to be distributed by the project that goes by this name. So far we have had one group session, and I think some of us are going to continue making garments for the project. We have also started supporting The Family Haven, based in Gloucester. This organisation was established in 1988 to help and support disadvantaged and vulnerable families in Gloucestershire. So far we have given them some household goods, and quilts and cushions made by us.